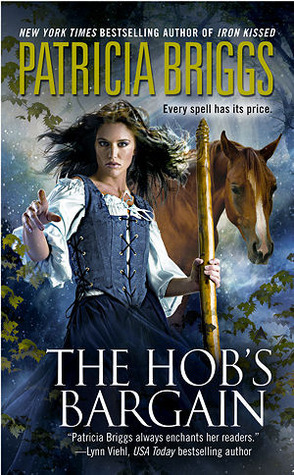 To save her village from ruthless raiders, Aren of Fallbrook strikes a bargain with the Hob, a magical, humanlike creature imbued with the power of the mountains. But the Hob will exact a heavy price to defend the village–a price Aren herself must pay. I was in the mood for Patricia Briggs, so I decided to re-read this one. It was nice to revisit Fallbrook. The world felt very believable. From how they focused on what was best for the village, to the contact they had with the rest of the world, to their fears and their prejudices. I liked how the villagers gradually became aware that not just magic, but other supernatural beings were stirring again. I loved how everything had a price, both when it comes to magic, and dealing with the supernatural. It was intresting to follow Aren, and the rest of the villagers as they fought to save their village from the raiders and the wildlings. But, they also struggled with their prejudices and their reaction to magic and wildlings. I admired Aren for her courage. Both when it comes to daring to speak about her visions, despite knowing what the cost would be. But also when it comes to putting all the clues together, and strike a bargain with the Hob. In fact, it felt as if it wasn’t until then the story really, started. But it was fascinating to follow Caefawn and Aren as he taught her how to harness her gifts. At the same time, he courted her. I liked the fact that the romance between Caefawn and Aren was sweet. It fit the story. In the end, it all come down a confrontation with the villain, and Aren stepped up. My heart almost broke at the sacrifice she made. This is one of Patricia Briggs earlier books. And it shows, the plot has its weak spots, the characters could do with a bit more fleshing out. Still, it wasn’t bad, none of Patricia Briggs books are. But… I had troubles connecting with the characters. Part of it was because I had read this story, many, many times :).